The Old West's favourite Scottish family return in this lighthearted Spaghetti Western scored by Ennio Morricone. RHV Italian R0 disc. 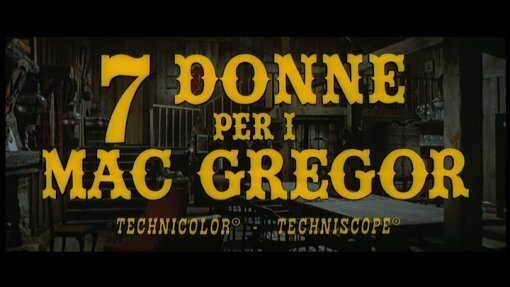 The Spaghetti Westerns boomed in the mid to late 1960s, and Sette donne per i MacGregor (1966) had been one of the more popular genre films of the year, its lighthearted tone contrasting with the often rather grim Westerns being shot in Europe at the time. For the sequel, writers Enzo Dell'Aquila and Ferdinando Di Leo return, and the film has a similar feel to its predecessor - however, although this means that we do get some often rather clever comedy (that doesn't resort to slapstick), some of the humour still feels a little forced, and the presence of some rather grim scenes (most notably a young girl walking through a massacred town) doesn't quite fit too well with the otherwise family friendly tone of the piece. The pacing is fortunately better than its predecessor, although still on the slow side, and it does build to a quite thrilling climax. The otherwise little known director Franco Giraldi is on top form here and the film looks fantastic throughout (the shots in the massacred town look superb), boosted by some solid production values and the usual good locations. Ennio Morricone again provides the soundtrack with the MacGregors' theme remaining unchanged. Although by 1967 many Spaghetti Westerns boasted all European casts, American actors were still often imported for the lead roles, and in this case the future star of long running TV soap Another World, David Bailey, gives a good turn as Gregor MacGregor. A number of familiar faces crop up in the rest of the cast including the young Alberto Dell'Acqua, best known from Texas Addio (1966), and Roberto Camardiel from Django Kill (1967) - many of the cast of the previous MacGregor film also reappear. Rather like its predecessor, Sette donne per i MacGregor is lighthearted, and avoids resorting to simple slapstick for comedy, but is rather too grim and brutal in places to be recommended for family viewing. For Spaghetti Western fans however, thanks to its effective direction and strong conclusion, Sette donne should prove enjoyable watching and comes partly recommended. Anyone famous in it? Several familiar genre faces but no-one of note. Directed by anyone interesting? Franco Giraldi - a lesser known director who also shot the first MacGregors film Seven Guns for the MacGregors (1967) as well as A Minute to Pray, a Second to Die (1968). Any violence? A couple of rather brutal deaths with some blood, and some very grim scenes. Partly recommended to genre fans who enjoy the more lighthearted Westerns. Good Soundtrack? A lively Ennio Morricone soundtrack. The image is very good with just light grain and speckling and good colours. Audio English and Italian mono tracks - the English dubbing is good. Unused footage - a selection of additional scenes shot for the film but never used including some alternate versions of a few scenes - very interesting as it features the frequent genre star José Manuel Martín who seems to be playing the Maldonado role, but does not actually play this (or any) role in the film itself. 10 minutes - silent with soundtrack from the film as backing. In anamorphic widescreen. Still photo and poster gallery, presented as a video file with soundtrack backing. The disc box includes an insert looking like a pressbook, that contains a complete cast listing for the film. Other regions? Not available on DVD elsewhere. Cuts? The film is believed to be fully uncut. Titles and credits are in Italian. An enjoyable although imperfect Spaghetti Western comedy. Partly recommended. A good looking and sounding DVD with a very good selection of bonus features. Find our other Spaghetti Western DVD Reviews. Find reviews of our other films with soundtracks by Ennio Morricone. All text in this review written by Timothy Young - 14th April 2007.